The Jewelry Sales and Marketing Program is a comprehensive hands-on approach to sales and customer service offered in two modules. 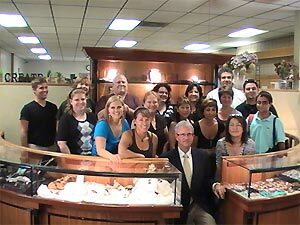 What makes this program so unique is that we send our sales graduates into the store with the knowledge of a professional jeweler! A "people-skills" developer for the industry, this course provides knowledge normally attainable only through years of personal experience. The course includes of one week of Design and Rendering and 5 weeks of classroom/field trip instruction. In the second half of the sales course, a one week Gem Identification class is included. Shorter courses for the Jewelry Sales Associate are available and designed for those who are working within the jewelry industry . This course is provided to students studying in other CIJT classes and by Gemologists and other jewelry niche occupations. We actively support our military veterans in their transition back to civilian life. Welcome Back!! Course approved and applauded by Industry employers.